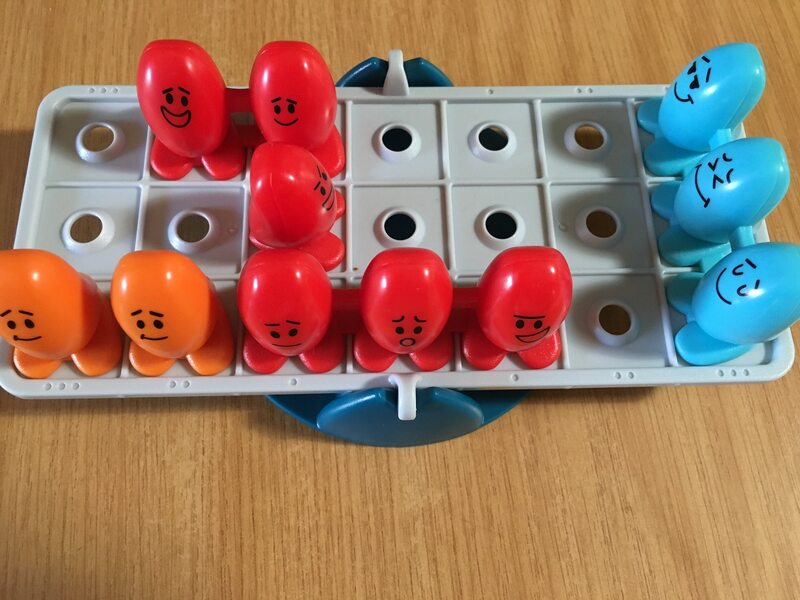 Balance Beans from Think Fun is a brain game of logic that combines physics and maths for 6 – 9 year olds. In reality it’s actually a concrete representation of balancing an equation. 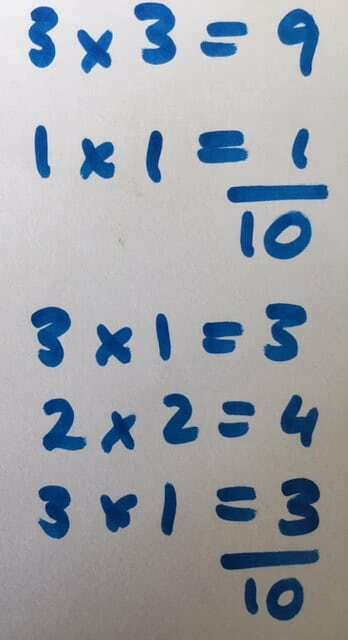 I always found that pretty baffling on paper when doing algebra at school but, when you actually play with equations in this way, it makes so much sense! Oh, that I had had such a game as this when I was young! Set up the Red Beans according to the Challenge Card. 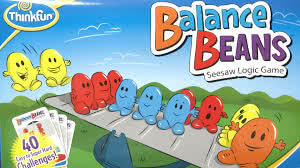 Then carefully place the colorful Beans on the Seesaw to balance it. Every Challenge card has a solution on the back, but it’s not the only solution. The multiplication option is a hidden secret in this little game of logic. Along the edges of the seesaw are little dots. Multiply the number of beans in a row by the number of dots and you have an answer. Add up all the answers on one side of the seesaw and see if the total balances with the sum of the other answers on the other side of the seesaw, and there you have an equation written out in number form – abstract learning! In this example here, both sides equal 10 – it is a visual representation of the set up on the seesaw above. Can you see? Now you have a game that teaches basic algebra in concrete form (real play with real objects), semi-concrete (the pictures on the challenge cards) and abstract (by writing down the numbers in the equation in writing on paper). Amazing! Nikki has recommended many Think Fun products over the years due to their high quality, educational and fun value as well as expert design. Retail outlets: Independent toy stores, Toy Kingdom and ToyZone. Visit www.ttdistributors for a list of stockists nationwide.